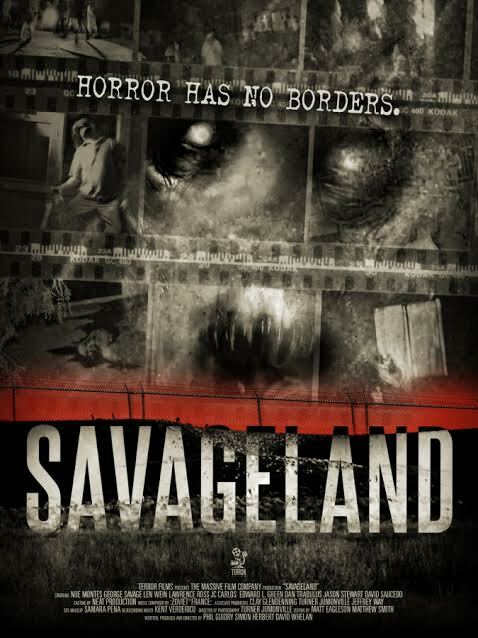 Terror Films will be releasing the award winning film, SAVAGELAND this Friday 24th February, across multiple digital and VOD platforms. The film tackles the very topical subject matter of illegal immigration, wrapped around the mysterious mass murder and disappearance of the entire population of fifty-seven people. The disappearances took place in the off-the-grid border town of Sangre de Cristo, Arizona, just a few miles north of Mexico. The police arrest the lone survivor, an illegal immigrant, Francisco Salazar. He is found covered with the blood of a number of his fellow residents. In anticipation of the film’s release, Terror Films is debuting the official poster, trailer and one more sneak peek clip into this eerie and very realistic faux documentary. The film not only swept the festival circuit racking up 8 Best Feature Film Awards, it has also been critically acclaimed as well. The film will be available on iTunes, Amazon Instant, Google Play/YouTube, Vudu, Xbox Live, Sony PlayStation, Vimeo on Demand, I Bleed Indie and 3 Roku channels, which include Free Flix Tonight, 24 Hour Movie Channel, and Free Grindhouse Flix Tonight. Terror Films company will be working on expanding the release in the coming months. Exclusive clip called 'Survivor' and the official trailer can be found below. Be sure to give SAVAGELAND's Facebook page a LIKE here.